In 1 Corinthians 13:13, the Apostle Paul tells us that faith, hope and love remain. In the last few devotionals, I have been talking a lot about love and faith. Today I want to talk about hope. If we have what we hope for, we no longer need to hope for it. There are some promises that God has made to us that we have not yet seen the fulfillment of. This is one of the those promises. 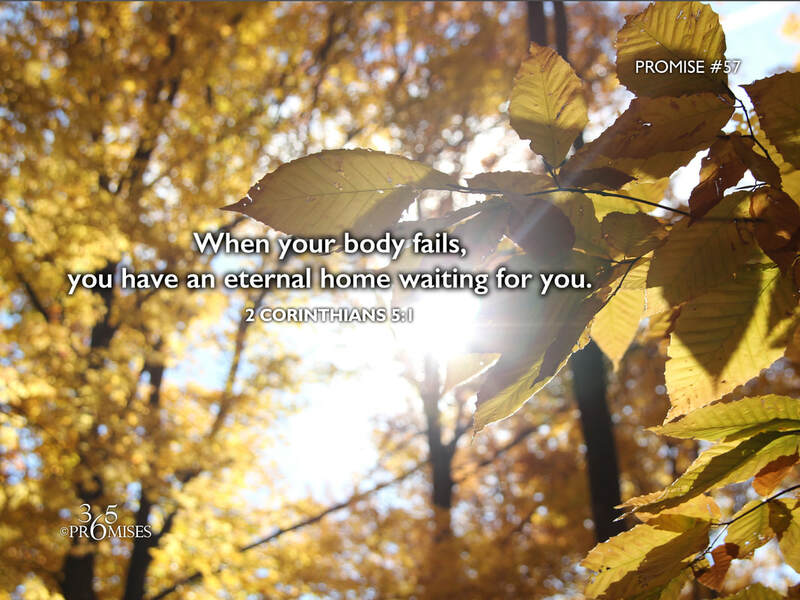 It is comforting to know that one day, when our body fails, we will have an eternal house in heaven that will last forever. This is a promise that we can hold onto with all our hearts. The eternal home that is waiting for us will not be built with human hands, but will be built by God Himself...and we will be a pillar in His house. On that day, we will no longer experience suffering or loss. Pain or disease will be gone, for we will be with God and He will be with us. May today's promise bring great comfort to us when we think of those in the faith who have gone before us. May we also be filled with hope ourselves knowing that we have an eternal home waiting for us too!